In the middle of the beautiful nature of Puntagorda lies the lovely holiday home Pabellón de Miramar. A fantastic holiday home for 2 people with a great view of the Atlantic and incredibly beautiful sunsets. The house has a very warm interior with beautiful details. The Canarian style is professionally combined with rustic, oriental and modern elements, the materials used are tastefully chosen and of high quality. Pabellón de Miramar is a detached holiday home in Puntagorda of 55 m² and is perfect for 2 people. The house consists of a large living room with lovely fireplace, for the cooler cosy evenings, and a typical Canarian roof, a well-appointed and fully equipped kitchen, a fantastic bedroom with a double bed (140×200) with direct access to the terrace with sea view, a bathroom with shower and toilet and a lovely terrace. Of course, things like internet, a washing machine, satellite TV, a dishwasher and a barbecue are available in this wonderful Pabellón de Miramar. From November to April, the heating in the bathroom is free. Around the house are several terraces where you can relax in the sun or in one of the shadier spots around the house. The house has a private parking space, a rental car is indispensable for this holiday home and can be booked here. If you want firewood is provided, € 15, – per bag, please indicate this when booking this holiday home. Pabellón de Miramar is surrounded by nature and has beautiful hiking opportunities in the immediate vicinity. The village of Puntagorda is about 3 km and here you can do all the shopping and visit the market on weekends. 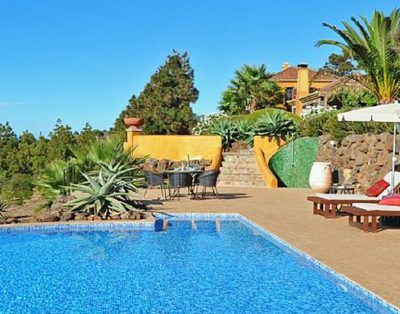 A dream home for two people on La Palma!